Back in the days of old, when Motown Philly was rising up the charts, and Beauty and the Beast was selling out movie theaters, 1991 to be exact, the Disney Vacation Club (DVC) officially started. DVC is a topic that creates a lot of confusion in the Disney universe, not because it is a complex program, but because unless you “get it” it makes no sense. Honestly though, it is a simple to understand program that works well for many families. 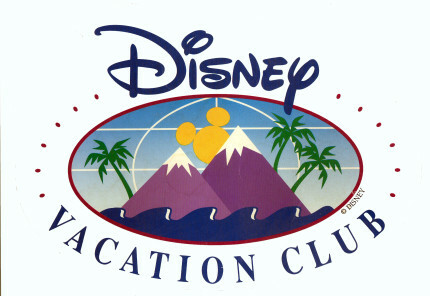 Back in 1991, the original DVC facility was called “the Disney Vacation Club”, and was later renamed Old Key West. 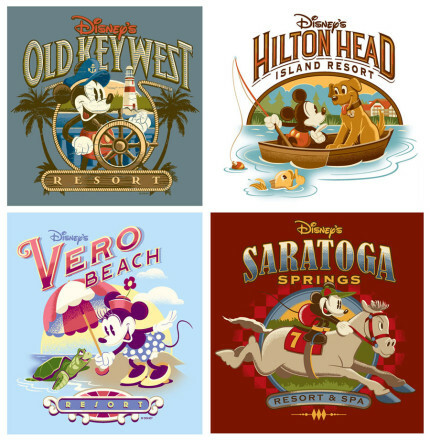 Since 1991 DVC has expanded to 13 properties at Walt Disney World, Disneyland, Aulani, Hilton Head and Vero Beach. The principal of DVC is pretty simple. Family vacations are important as they allow families to have fun, relax and make memories. It is also important for families to have a place to call “home” while on vacation.DVC realizes that the way you vacation can change, where you vacation can change and the number of people you vacation with can change with time. Because of this DVC uses a point system to make sure the way you use your DVC points is just as flexible as your travel style. You aren’t trapped into a set week a year at one set location, instead you can use your points to travel when you want, where you want, how you want. Buying into DVC is considered a real estate purchase, that is part of why DVC doesn’t put a lot of pricing information online to adhere to all 50 states varying real estate advertising laws. There are two ways to purchase DVC points, one is directly through Disney, the other is through re-sale. Due to the fact re-sale is a total different ball of wax that adds to the confusion, for this article we will be focusing on the direct Disney purchase option. As we’ve mentioned, DVC works on a point system. To purchase directly through DVC is simple, you can contact them before hand by calling (800) 500-3990, or by signing up to do a tour of their villa models at any DVC desk in the parks or in Disney resort lobbies. 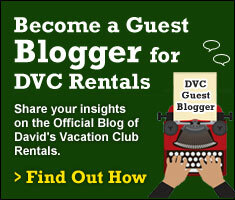 DVC points are offered at a fixed price. On occasion there will be specials offered giving you an extra year of points at no cost, or X off per point, but these sales tend to last the whole calendar year unless published otherwise. Usually when you purchase into DVC, you need to buy a minimum of 100 points at the resort you buy into. On occasion DVC will offer a special regarding the number of buy in points you have to purchase. Your DVC points are issued annually at the start of your “use year”, which is the month your new points are always released to you. For example lets say you purchase 200 points in November. You can either use all of your points from this November’s points over the the 12 month use period, use some of them and bank (roll) the rest to next year, or bank all of them if you don’t plan on vacationing. You can also borrow from next year’s points if you need to, but remember you can only borrow from the next use year, the borrowing option doesn’t provide you with an unending pot of points. Also points are borrowed DVC members will want to remember that if a trip using borrowed points has to be canceled, those points don’t return to the pot they were borrowed from. They have to be used in the use year the trip was booked in. Banking also has restrictions, you must bank your points 4 months before the end of your use year, if you don’t you will need to either use, loose or rent them out to avoid loosing money on your points investment. Members banking points also need to remember that banked points must be used in full by the end of the next use year, so make sure you use those banked points first when booking. Thankfully Disney’s new member portal makes remember exactly when that is a LOT easier. Disney now also offers members in need of a small amount of points “option of paying for a one-time assignment of as many as 24 vacation points from Disney Vacation Development, Inc.” Members should contact DVC directly for information on this option. Now, to put the borrowing concept to use, using the 200 points above, say you need 300 points, you would use all of this year’s points and borrow 100 from next year, leaving you 100 to use or bank next year. How many points you use per trip is based on the resort you choose, the number of nights you stay, the room type, and the time of year you choose to travel. With DVC you decide how many points you want to buy, the resort you buy them at based on current availability, and how you use them. DVC’s point system tends to be what confuses people the most so follow me for a moment as there are basically 3 parts to that process. I hear you saying ok what?, so to start with I am going to use DVC’s official math and explanation, and then break it down for you into English. The amount per point is based on the resort you buy into, and the special at the time. As a Member, you can lock in today’s purchase price, and save while enjoying years of vacations you never outgrow, just like the many Members in our Disney Vacation Club family. Stretch your vacation dollars by locking in decades of future stays at Disney Vacation Club Resorts at today’s purchase price. When you travel effects the number of points you use. DVC has split the year into five seasons. 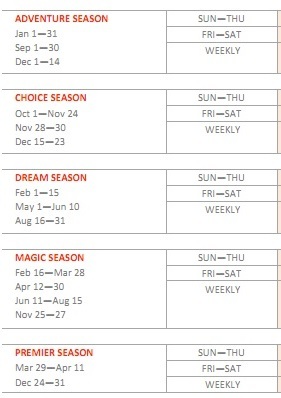 The dates on these seasons change change slightly based on when holidays fall, projected park attendance levels etc. but they are always clearly defined in each years point chart. Adventure season is the “slow” season, each season after on the chart the attendance levels go up, and with each raise in season level, your points per night go up. The next factor in points per night is WHAT nights you are staying. It costs less points to stay Sunday, Monday, Tuesday, Wednesday, and Thursday night that is does to stay on Friday and Saturday nights for obvious reasons, the parks are busier on the weekends than they are during the week regardless of what time of year you go. The weekly point rate is just the total of points needed for a Sunday-Saturday stay in the same accommodations the whole week. DVC provides you with a wide array of accommodation options to choose from, you even have several options on where you stay at a Disney Resort while staying on points. 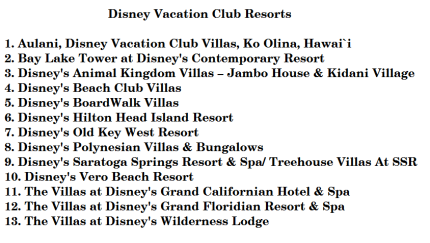 First you have those thirteen direct Disney Vacation Club owned resorts I mentioned earlier to choose from. Some of these facilities were built by DVC, others had facilities built at or in existing Disney Resorts. DVC resorts offer their guests Villa style rooms. Your basic studio can sleep up to four or five depending on the resort and has a small kitchenette, bathroom, bed, sofa and TV. The one-room sleeps 4 or 5 depending on the resort but gives you more space with a master bedroom, which usually has a king bed, a living room with pull out sofa, a full kitchen, a washer/dryer, and one to two bathrooms. A two-bedroom sleeps up to 9 people depending on the resort, has a master bedroom, pull out in the living room, and second bedroom with two queen beds, a full kitchen, a washer/dryer, and two or three bathrooms. Select resorts have Grand Villas. These amazing accommodations have everything a two-bedroom has, plus a second two queen bed room, at least three bathrooms, a full dining room, and sleep up to twelve people. These accommodations make it easier to feel at “home” while on travel. When you purchase into DVC, the resort you buy into is considered your Home Resort. This is important because this is the resort that you can book on points 11 months in advance of your intended check-in date. When you wish to book a DVC resort that is not your Home Resort you can book it on points 7 months in advance of your intended check-in date. 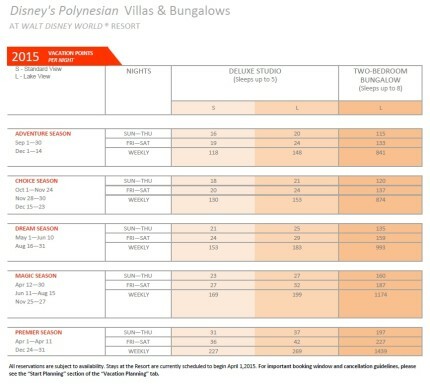 Using the earlier mentioned Polynesian as your home resort, as of today (8/26/15) “you can book your arrival as far out as July 28, 2016 for a stay up to August 4, 2016″ and a Non-Home Resort: like Bay Lake tower can be booked “your arrival as far out as March 28, 2016.” The resort you choose effects the number of points you use each stay. Like with paying cash at a Disney Resort, the closer to the parks your get, the higher the cost. The resort that you choose to be your Home Resort is yours, the thing is you have to buy from available stock. Currently new contracts are available for the Polynesian, Aulani, and the Grand Flordian. Other DVC resort contracts may be available for purchase at this time, but that would be something we encourage you to confirm with DVC directly. You also can always add on points or purchase a contract at a new location. DVC is nice enough to match the use year of any additional contracts you purchase through them to make keeping track of when your new points are released, when you need to use them by, and when you need to bank all of your contracts easier on you. 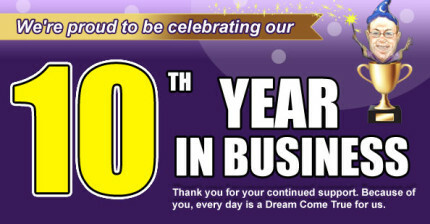 DVC memberships are usually for fifty years when purchasing directly through DVC. These memberships help ensure you have fifty years of family vacations and memories. Memberships can be willed and sold as needed. 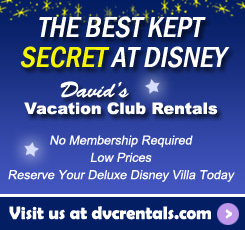 Disney Vacation Club points can also be rented out. When a member can’t use their points before they expire they will contact places like our sponsorDavid’s Vacation Club Rentals. David’s acts as the middle man ensuring that people who want to rent out points are connected to people who want to use said points in a quick and seamless process. A part of the flexibility with DVC is that you don’t always have to stay at a DVC property when you go to the parks, and you don’t always have to go to a Disney park. Because of this DVC offers their members three “collections” to choose from when booking a non DVC Resort vacation.The first option is the Disney Collection, which is a way for DVC Members to use their points while traveling to Disney Parks and other Disney destination. It is made of up select Disney Resorts not owned by DVC like Paradise Pier, the Disneyland Hotel, Port Orleans, the suites at Art of Animation and more. You can also use your points to book Disney Cruises, and at Disney hotels in Paris, Hong Kong, and Tokyo. The Disney Collection also covers Adventures by Disney, and due to ingenious leadership of DVC/ABD Vice President Ken Potrock, DVC Members can take advantage of special Adventures by Disney trips that can only be booked by DVC Members. The Disney Collection does tend to have a transfer fee under $100, and the rooms booked using the Collection option can in fact use more points than a DVC resort room. 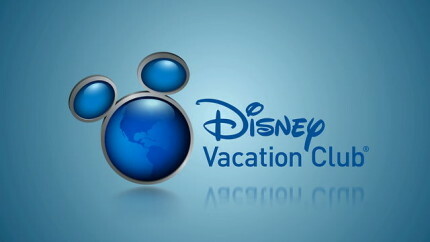 The next two collections allow DVC Members to convert their points and go to locations owned by other timeshare groups. The Concierge Collection lets members swap points with Silverpoint. Travel destinations can vary but for 2016 include places like InnSeason Resorts Pollard Brook, Lincoln, NH; The Sagamore, Lake George, NY; Royal Garden Hotel, London, England; Paradisus Cancun, Cancun, Mexico; Mandarin Oriental, Washington, D.C.; Grand Wailea Resort Hotel & Spa, Maui, HI; Podere San Filippo; Florence, Italy and more. The World Collection which was previously named the World Passport Collection, has been updated to “include thousands of vacation options in destinations around the globe, available with exchanges through RCI and Buena Vista Trading Company.” Both options allow DVC Members to see the world while using their existing points. So now that we have covered the fact that DVC stays are based on when you go, where you stay, and how you stay, let’s discuss DVC Membership perks, because we all love Disney Perks. Of course there is member only swag like pins etc. that can only be purchased when showing your membership card, but that’s not all! Did you know there are two DVC Member cruises that can only be booked by DVC Members that purchased their points directly through DVC? These special Member Cruises are amazing! I recently went on the 2015 Member Cruise to Alaska and to touch on just a few special things that were offered, I attended a drawing class hosted by Eric Goldberg, sat in on a D23 Archives presentation, met the director of several Disney Nature movies after his presentation, experienced a Disney Broadway Originals performance, and received special Member Cruise goodies daily. Another great DVC event is the Merry Mixer held on select days during the Christmas season at Epcot. This event offers music, crafts, character meet and greets and more. Then of course you have special member’s only pop-up events, currently called Membership Magic events, like this summer’s water park parties. DVC Members also have the ability to purchase Walt Disney World Annual and Premium Annual Pass at Florida Resident rates and take advantage of other discounts that are published in the DVC Member Portal. While DVC Membership isn’t for everyone, for those whose travel style and budget it does fit, it is in my opinion a great investment. I personally have been a DVC Member since 2006 and feel joining is one of the best decisions my husband and I ever made as it makes us take the time to travel and enjoy each others company without the chaos of work and daily life, as well as affords us the ability to take our friends and family with us to Disney on occasion. ~ Our Guest Blogger, Scott Atwood, is the Webmaster/Co-Owner of The Main Street Mouse, TMSM Geek, and Off TMSM. You can contact him via @TMSMAvenger, www.TheMainStreetMouse.com, www.TMSMGeek.com, or www.OffTMSM.com. 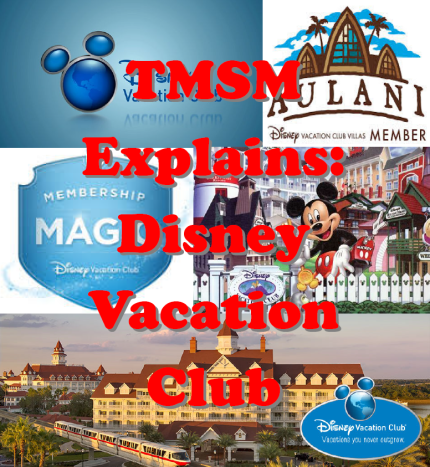 One thought on "TMSM Explains: Disney Vacation Club Membership"